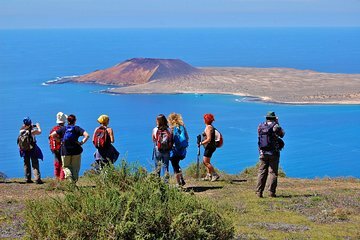 Deze gematigde 5-uur durende wandeltocht is ontworpen voor actieve reizigers en brengt je naar de kam van de Monte Corona-vulkaan, de thuisbasis van een van de grootste kraters van Lanzarote. In een kleine groep van maximaal 10 trek je over lava-gebeeldhouwde landschappen, kijk je in de krater van de Monte Corona-vulkaan en neem je een panoramisch uitzicht op de Canarische eilanden in vanuit de kliffen van het noorden van Lanzarote. Een gemiddeld fitnessniveau en stevige wandelschoenen zijn vereist. Vervoer van en naar het hotel is inbegrepen. Absolutely terrific - if you like to hike. Gorgeous views. Carmen, the owner, offers personalized tours and our guide, Martina, was so accommodating to everyone's needs -informative, knowledgeable about the ecology, geology etc. A perfect (tiring) but satisfying outing. Good group to go with! This was a great day out. We were picked up outside our villa and after a short drive we arrived at the base of the volcano. We then walked up to the lower edge of the crater, stopping en-route while our guide Alena explained the flora and fauna. Our descent down was off the main paths and did require a little care as often the ground was loose. Fortunately we had good-quality walking shoes which I would say are essential. We stopped briefly for a snack lunch, baguette, fruit and water, provided by Alena. We finally got back the transport and then off to the north coast with fantastic views of La Graciosa. The great thing was there was never any rush and everything was explained. Alena is an enthusiastic ornithologist and we were very lucky that at one point she spotted a pair of Egyptian vultures circling overhead, apparently a rare site. Finally back in the Land Rover and we were delivered back to our front door. If you plan to go on this walk, be prepared for slightly tricky sections at times, it's certainly not for those with any impairment of mobility. Finally, you'll see a little dog in the pictures, apparently accompanies Alena and her colleagues every time they do this tour, and never left our sides for the whole day! Many thanks to Alena for making this such a great and enjoyable day out. Great experience with some stunning views. Although we went in March we caught the heatwave with temperatures hitting the mid 30s, so sun block is recommended if your there in the summer season. A steady pace is set and our tour guide stopped many times to talk about the flora and fauna of the area,very informative. A must for adventurers young and old. Our guide Sara was excellent, very knowledgeable about flora and fauna. It was a beautiful walk, which would very almost impossible to find without a guide. Lovely views on volcano crater and La Graciosa Island from the cliffs. Not recommended if you don't like heights. I really enjoyed my walk with a well informed guide. Good references to the geology and natural history of the island. It was absolutely famous experience. 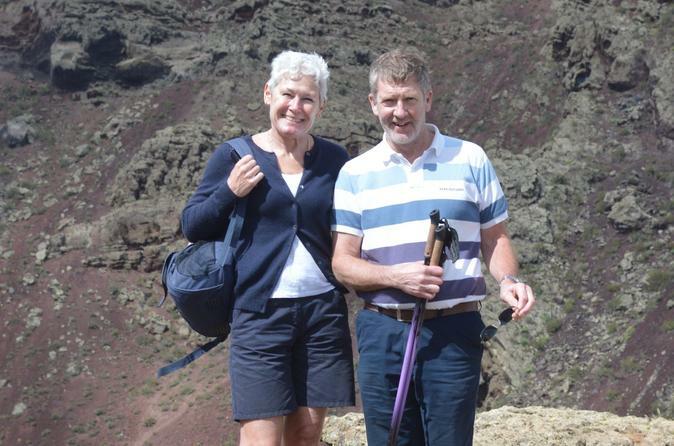 The walking tour was the best tour ever in Lanzarote. I have to say, that it was quite hard, but not difficult. The wiews were breathtaking and scenery was flowering. There was already early springtime. And also our guide Elena was a really proff, who knowings about Lanzarote, Monte Corona, Cliffs and nature were impressing.